Synthetic peptide within Human INPP4B aa 1-100 (N terminal). The exact sequence is proprietary. MCF7, fetal skeletal muscle, fetal heart lysates and muscle tissue. Our Abpromise guarantee covers the use of ab81269 in the following tested applications. WB 1/1000 - 1/5000. Detects a band of approximately 107 kDa (predicted molecular weight: 107 kDa). Catalyzes the hydrolysis of the 4-position phosphate of phosphatidylinositol 3,4-bisphosphate, inositol 1,3,4-trisphosphate and inositol 1,4-bisphosphate. Widely expressed with highest levels occurring in the skeletal muscle and heart. Signal transduction; phosphatidylinositol signaling pathway. Belongs to the inositol-3,4-bisphosphate 4-phosphatase family. Immunohistochemistry (Formalin/PFA-fixed paraffin-embedded sections) - Anti-INPP4B antibody [EPR3108Y] (ab81269)Image from Stjernström A et al., Cancer Medicine. 2014;3(2):337-348. Fig 1(A). ; doi: 10.1002/cam4.191. Immunohistochemistry analysis of formalin-fixed and paraffin-embedded human squamous cell carcinoma tissue sectioned at 4 μm and placed at 60°C for 1 hour. Slides were deparaffinized and antigen retrieval was carried out by microwaving the slides in Tris-EDTA buffer pH 9 at 650 W for 30 minutes. Samples were incubated with ab81269 (1/50) for 25 minutes at room temperature. INPP4B positive expression shows strong cytoplasmic staining. Magnification: X40. Immunohistochemistry (Formalin/PFA-fixed paraffin-embedded sections) - Anti-INPP4B antibody [EPR3108Y] (ab81269)Image from Stjernström A et al., Cancer Medicine. 2014;3(2):337-348. Fig 1(B). ; doi: 10.1002/cam4.191. Immunohistochemistry analysis of formalin-fixed and paraffin-embedded human squamous cell carcinoma tissue samples sectioned at 4 μm and placed at 60°C for 1 hour. Slides were deparaffinized and antigen retrieval was carried out by microwaving the slides in Tris-EDTA buffer pH 9 at 650 W for 30 minutes. Samples were incubated with ab81269 (1/50) for 25 minutes at room temperature. 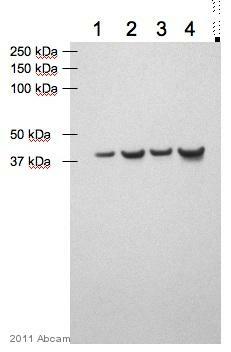 INPP4B negative expression. Magnification: X40. Immunohistochemistry (Formalin/PFA-fixed paraffin-embedded sections) - Anti-INPP4B antibody [EPR3108Y] (ab81269)Image from Stjernström A et al., Cancer Medicine. 2014;3(2):337-348. Fig 1(C). ; doi: 10.1002/cam4.191. Immunohistochemistry analysis of formalin-fixed and paraffin-embedded human skeletal muscle tissue (negative control) sectioned at 4 μm and placed at 60°C for 1 hour. Slides were deparaffinized and antigen retrieval was carried out by microwaving the slides in Tris-EDTA buffer pH 9 at 650 W for 30 minutes. Samples were incubated with primary antibody substituted for antibody diluent for 25 minutes at room temperature. Immunohistochemical analysis of paraffin-embedded muscle tissue using ab81269 at 1/50 dilution. Publishing research using ab81269? Please let us know so that we can cite the reference in this datasheet.